Case of double diaphragmatic rupture and hernia. Washington : Government Printing Office, 1873. Description : 115–119 p., [1 l.] pl. ; ill: 1 phot. ; 24cm. Photograph : heliotype on printed leaf, depicting the autopsic specimen. Subject : Diaphragm — Hernia. Author caption: Reported by Thomas T. Minor, M. D., Surgeon United States Marine-Hospital Service, Port Townsend, W. T.
Surgeon, U. S. Army, Civil War. Medical degree, Yale University, 1867. Photo caption: Plate X. Double Diaphragmatic Hernia. Photo caption: A. Diaphragm, showing inferior surface. B. Hernia of large intestine and omentum. C. Hernia of small intestine and omentum. Separate edition issued with a woodcut. Several pages supplemented by Woodworth, editor. John Maynard Woodworth (1837-1879) was Surgeon General of the United States Marine Hospital Service, 1871-1879. The preparation from which the accompanying photograph was taken, has been deposited in the Army Medical Museum, medical section, No. 1199; and in the same collection are also to be seen preparations, No. 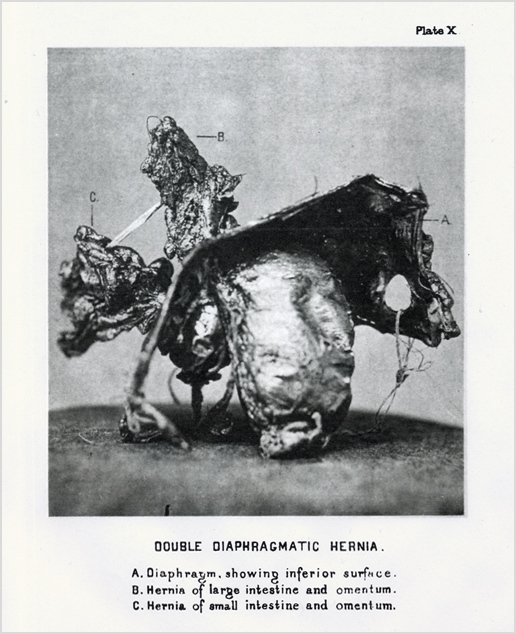 522, medical section, showing a hernia in which the stomach and a large portion of the greater omentum have passed through the oesophageal opening of the diaphragm into the thoracic cavity, with fatal result; and No. 1789, surgical section, consisting of several ribs, the stomach, a portion of the omentum, and the diaphragm, exhibiting a hernia of the entire stomach, through an old gun-shot wound of the diaphragm, death ensuing from strangulation. A full list of titles of the bibliography of the subject will also be found, in connection with the description of this last, on page 205 of the second part of the Medical and Surgical History of the War, now in course of preparation.—W. ]—Page 119.